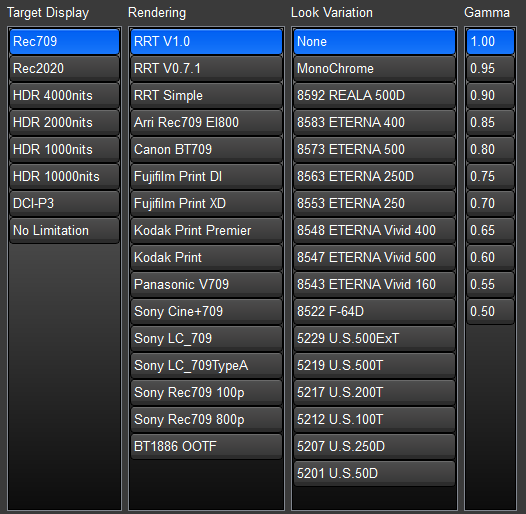 WonderLookPro defines "Rendering" as "To convert scene reffered image to output reffered image". To speak more simple, it is to transform the image more suitable for the reproduction. WonderLookPro is offering various rendering parts, like film look or selection of gamma, which are categolized into "Rendering". Here is the table of various color transform which are available in WonderLookPro. First of all, color space conversions and broad meaning rendering have huge differenct. Former one, color space conversions, will change the number of the color, but the color itself will not be changed, keeping visually the same color. Latter one, broad meaning of rendering, keeps the same number for the same color, but is to change the color visually by changing the number. Broad meaning of rendering can be divided into narrow meaning of rendering and color correction. In the real world, you don't need to divide these two segments strictly. You can just remember that, narrow meaning of rendering to convert scean referred image to output referred image, which is suitable for the reproduction, and color correction is all other transforms than narrow meaning of rendering. The most important thing is "Rendering changes the color itself!". What happens if you skip the rendering from the process? No rendering means to reproduce the original scene referred image on the monitor. It is usuful for the usecase, which requires to view as correct color as possible of the original objects, like medial imaging or artificial recording images. In these cases, the imaging system will be made wihtout artificial rendering, to achieve faithful reproduction on the monitor. Off course, WonderLookPro can help to make this workflow, no rendering and correct input and output transform. But, for feature film, commercial and dramas, which wil be made to entatain audience by creating colors for the producers intent, faithful color reproduction is not suitable. Many attempt to make more effective image by color reproduction will be made, for more colorful, more vivid images, for more sustained color to intend psycological effect....These color expressions can be called rendering in broad meaning. In WonderLookPro, the output referred image will be made by broad meaning rendering, which consists from narrow meaning rendings provided by WKP's preset transform, and color correction create by user itself. Following will be shown a couple of example of narrow meaning of rendering, which are provided as preset transform on WonderLookPro. 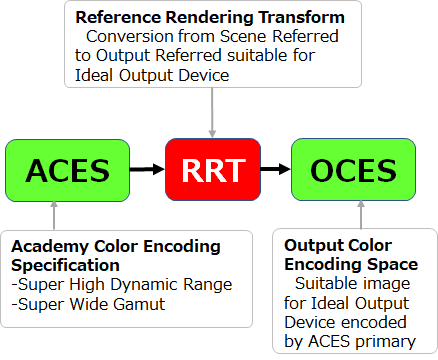 Scene referred ACES image will be transformed to output referred OCES by RRT. The role of RRT is used be done by color negative film and color positive film. AMAPS's design says, RRT is the only one transfrom so exactly the same OCES should be obtained from one ACES image. Creative colors are make by LMT, Look modification transform. In the real world, there are a wide variety of purposes, targets so it turned, it is not feasible only one RRT peform the role of the rendering. Many projects prefer more soft, less saturated transform than RRT. WonderLookPro provides wide variety of the candidate for the rendering. User can select most suitable rendering on the direction of the project from the candidates, and will add customized looks scene by scene. For example, you can get positive film projected feeing image just by selecting FUJIFILM Print DI on the rendering. You can enjoy the combination of a couple of positive film looks and tens of negative film looks with the variation of soft and hard. Thanks to the ACES architechture WonderLookPro is based onm you can get very close image even for the different type of cameras. OOTF in HDR workflow is one of the rendering. Here is the PQ's workflow. The left side of OOTF is scene referred, right side is output referred so the monitor will receive PQ signal as output referred image. HLG's workflow illustrated as below. OOTF is built in the monitor and both the signal froom camera, the signal feeding to monitor are scene referred image. - HLG signal is scene referred and no OOTF would be included. - PQ signal is output referred and OOTF should be included. The process to be shown on PQ monitor could be following two patterns. The image on No.2 will be matched with No.1, but not matched with No.3, because of the difference of OOTF. We can not tell which is the answer. Both would be feasible depend of the intension of the project. It shows you have to take a detailed care about OOTF when you convert PQ/HLG vice versa. You can make these setting esily on WonderLookPro, adding to the selection of these color spaces, you can select OOTF in any direction, or adding any rendering to this transform. WonderLookPro manages various rendering as CTL, which is script language to express color transform, to achieve maximum quality. Some rendering are managed in 3DLUT if there is no way to express in mathematical calculations. Input and output color space of all of the rendering transforms is ACES. It means these can be applied to any workflow and these can be concatenated for any numbers of renderings. Currently, WonderLookPro allows the conbination of these renderings in limited combinations, because of the restriction of user interface, but it will be cleared and you will be able to use any combination of renderings in near future.